The dental field is a constantly evolving place, and our team is happy to elevate the quality of your experience whenever possible by incorporating modern techniques and tools into our care as they become available. With these additions, patients can enjoy greater comfort, speed, and accuracy at every stage of the treatment process! Contact our Chevy Chase, MD practice today to schedule your first appointment, or if you have any questions. Dr. Ronan Freyne looks forward to meeting you and helping you determine the best direction possible for your individual needs. 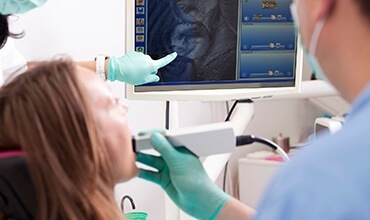 With the help of an intraoral camera, it’s easier than ever for our team to view your teeth in perfect detail, uncovering cavities, worn structure, minor cracks, and much more! These high-resolution images are captured on a camera-tipped wand and instantly transferred to a convenient monitor in the room so that both our team members and you (the patient) can enjoy an up close and personal tour. In addition to providing important diagnostic information, it’s also a helpful educational tool. Dr. Freyne can point out specific areas of damage, explain the effects of certain treatment options, and generally help our patients feel like they’re full partners in their oral healthcare journey instead of simply being along for the ride. 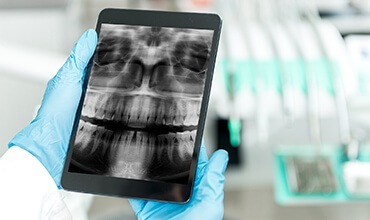 Being able to see underneath the surface of patients’ smiles in order to diagnose instances of damage and decay is absolutely essential for our team, which is why Dr. Freyne has chosen to invest in digital X-rays here in Chevy Chase. Unlike traditional film, digital X-rays eliminate tedious darkroom development and the use of hazardous chemicals altogether; instead, images are captured and instantly accessible on our computer system with no waiting required. Radiation exposure is also greatly reduced by up to 75%! After all, your safety is of the highest importance to us. Our state-of-the-art soft tissue laser is a very important tool that blows the traditional scalpel out of the water when it comes to periodontal treatment. The focused energy is able to precisely treat and remove diseased tissue while providing instant sterilization – this means that common post-operative symptoms like bleeding and swelling are kept to an absolute minimum, and the recovery period is greatly accelerated too. In fact, patients are kept so comfortable that most don’t even require anesthesia for the procedure! Better yet, the laser encourages the growth of new, healthy tissue to replace what was removed. Traditional impressions are captured using a soft putty. Patients bite into this goopy material until it hardens, recreating the smile. These physical impressions were shipped to dental labs where a crown, bridge, or other restoration could be created. 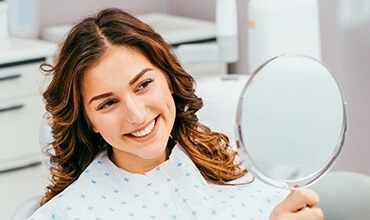 Digital impressions allow us to capture reflections of the shape and form of your bite without the goopy physical bite casts. 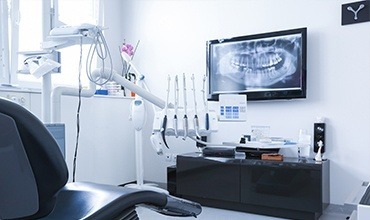 In addition to being easier to capture, they are also immediately viewable on chairside computers and can be instantly transferred to our dental labs reducing the time it takes to create your restoration. The digital impression scanner allows us to more precisely plan dental restorations and complete treatments. That means patients get a perfectly fitted restoration every time.